All of our gadgets are getting smaller and more portable…except for the printer. Even the smallest printers are still as wide as a sheet of paper and thick enough to hold ink cartridges. They might be technically portable, but really, who would want to carry around such a bulky object? 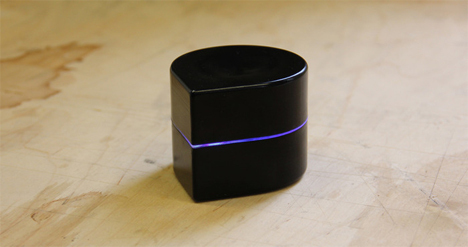 The designers at Zuta Labs took a look at the traditional form of a printer and tried to boil it down to its essential functions. Basically, all a printer really needs to do is to deposit ink onto a piece of paper in the requested spots. It does what you could do with your hand and a pen. Couldn’t that be accomplished with a device much smaller than those bulky printers? 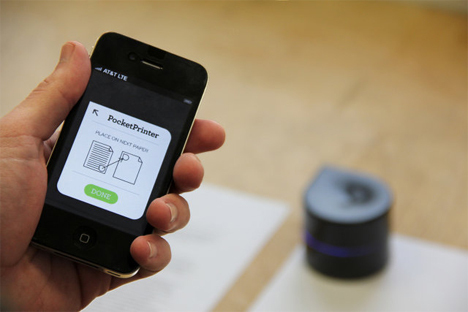 The Pocket Printer is what they came up with: a completely bare-bones version of a printer that still performs its job admirably. 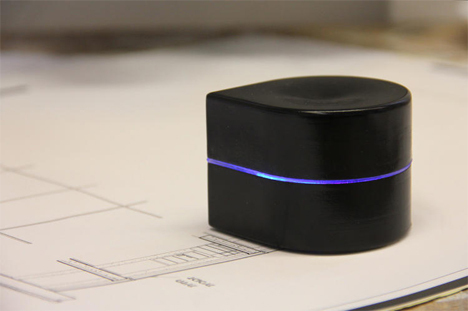 The palm-sized office tool is wireless and rechargeable, and a single ink cartridge can print over 1,000 pages. The current version supports Android, iOS, Linux, OSX, and Windows. To use it, you just place the Pocket Printer at the top of a page. Using the attached smartphone app, you tell the printer what to print and it dutifully races across the paper from left to right, depositing ink just where you tell it to. Besides the fact that printer is adorable and sort of hypnotizing to watch, the best part about it is that it is truly portable. This is a printer that you can really stick into your laptop bag and take with you anywhere. And in a world that’s getting more portable by the day, it’s about time printers caught up.